For today's tour, I'm actually reviewing all three books in this series. Since the tour is technically for book #3, I'll start with that review and list the books in backwards order. Summary from Goodreads: In an instant everything changes for seventeen-year-old Cassie Moore. Together she and her time-traveling boyfriend, Trent Astor, battle to survive their next impossible challenge. As they navigate through a third parallel world in which Cassie begged Trent to create for her, the two soon discover that no world can be made perfect. Meanwhile, it seems Trent and his sister, Lorelai, will never be safe from the greedy world and its hunger for Trent's power. A new force threatens to destroy the anonymity Trent has fought for his entire life unless he can stop this new opposition first. But every choice has a consequence, and Trent is faced with the most difficult choice of his life. Set in contemporary Northern California, The Vortex Series is a teen romance for those who also enjoy a bit of science fiction and fantasy. Told in two perspectives, we get an intimate view of both Cassie and Trent’s worlds. Family relationships, how they interconnect and drive our personalities, is the heart and soul of this YA time traveling novel. 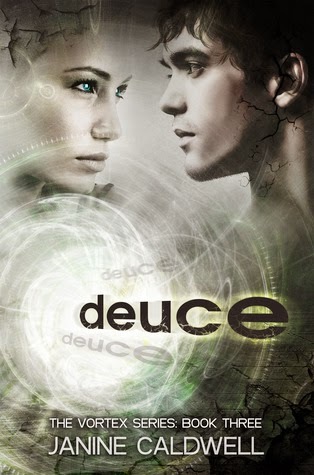 Deuce is the final installment of the Vortex trilogy. In this book, Cassie finally gets the life she was hoping for and has had a chance to learn from the mistakes of her first two lives. Of course, it doesn't all go smoothly and Cassie finds a new curve ball thrown at her that she never expected. The big event near the end. Something happens toward the end of the book that I had a hard time with. I just couldn't quite wrap my head around it - or Trent's response to it. I'm not exactly sure why, except that what happened didn't feel exactly necessary to me. Because of this, the end of the book was hard for me to connect to (at least until the very end). Jeff. I thought that we were going to finally be rid of Jeff in this third book, but unfortunately that didn't happen. Even though Jeff and Cassie started out as just friends (with no feelings on either side), it didn't stay that way. I was tired of Jeff by this third book and especially tired of Trent's jealousy of him. The third life. The third time really was a charm for Cassie and Trent - at least mostly. I really enjoyed seeing this third incarnation of Cassie's life. The one where she got to fix all of the major problems and live her life without regrets. Yes, there were still problems (the biggest one being that Cassie's parents are now super loving, but also slightly overprotective and don't approve of her relationship with Trent), but overall, her life is what she's been hoping for. More time traveling. (MINOR SPOILER) One of the best things about this book was the fact that Cassie becomes a Traveler herself. (This is a slight spoiler, but you find this out early in the book, and most people would probably have guessed it at the end of book #2 - I know I had). I loved seeing Cassie go through the experience of traveling through time and realizing just how crazy Trent's life truly was. Being new at traveling, there were things that she needed to figure out, and it wasn't all easy. Cassie's time traveling experiences and what happened during her trips were definitely my favorite parts of the book! Cassie and Trent. While things were still sometimes rocky for Cassie and Trent throughout book #3, I loved seeing them finally truly together. And the ending to the book was very sweet and gave me a clear vision of what Cassie and Trent's future might look like! Overall, I'd say that Double Fault was a fitting end to the Vortex series. This series was a fun read - great for its intended YA audience. I give it 3.5/5 stars. Summary from Goodreads: DOUBLE FAULT is the 2nd book in The Vortex Series where Cassie and Trent’s problems have only just begun. As they fight through the repercussions of creating a parallel world, other dangers are lurking. After years of running, Trent and his orphaned sister, Lorelai, sense the dangerous and power-hungry Dr. Fox is close to discovering their whereabouts. 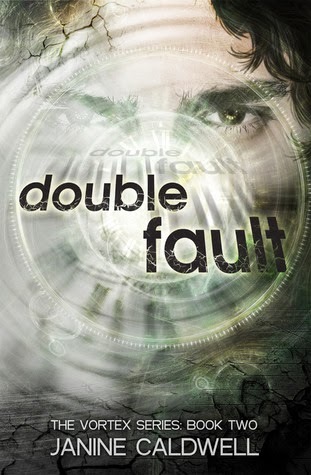 Double Fault is the second book in Caldwell's Vortex series, in which Cassie and Trent have to live with the consequences of Trent's decision to change Cassie's past (yet again). Jeff. Even though Cassie broke up with Jeff in the first book, he can't quite seem to get the hint, and he won't give up on her. Plus, Cassie has to live with the fact that her relationship with Jeff went further than she would have liked now that she remembers the "past" that she should have had with Trent by her side. At face value, I didn't mind this so much, but Trent's constant jealousy over Jeff made me a little crazy. On the positive side, Jeff did come off as less of a jerk in this book - he was humanized a lot more. Cassie's "improved" life. At the end of Rematch, Trent made the somewhat rash decision to "fix" Cassie's life by going back and making sure that she never got shot at all. Well, her new improved life turns out to by pretty miserable in a lot of ways. Honestly, I thought that Cassie had the patience of a saint because I don't know how she managed not to just plain blame Trent for all the problems in her life, since she knew that she had specifically asked him not to change things and he went ahead and did it anyway. But, Trent's stupidity over his guilty conscience led to a really interesting story. I was so intrigued by the concept of how changing one (major) detail in Cassie's life spiraled out into a million more changes that Trent could never foresee. I loved seeing the butterfly effect and discovering more and more things that were changed by that one event. Hunted. In this book, we really got to see why Trent and Lorelai have been on the run and we get to come face-to-face with the man who's been hunting them. There are some really action packed scenes in this book because of that! The ending. This book ends with a bit of a twist that left me eager to read the next book in the series! Double Fault was a fantastic second installment in the series. I give it 4/5 stars. Summary from Goodreads: Trent Astor is many things—orphan, runaway, musician. But what’s most extraordinary about Trent is that he’s a time traveler. His supernatural gift sends him on missions to the past to save unsuspecting victims from harm. However, when he fails to save the life of a young girl, his life changes in ways he could never have dreamed. Set in contemporary Northern California, The Vortex Series is a teen romance for those who also enjoy a bit of science fiction and fantasy. Told in dual perspectives, we get an intimate view of both Cassie and Trent’s worlds. Family relationships, how they interconnect and drive our personalities, is the heart and soul of this YA time traveling novel. Rematch is a sweet paranormal romance. Trent is a time traveler - he travels to the past to fix save people in danger. He is devastated when he thinks he is unable to save an 11-year-old girl from a shooting. However, once he returns home to the present, he meets Cassie and discovers that she is in fact the girl he attempted to save. Though she was still shot and has suffered some emotional damage because of it, she didn't die. Still, Trent can't shake his need to protect her - and to set things right in her life once and for all. Hot and cold. As often happens in YA novels for some reason, Trent felt he needed to be hot and cold toward Cassie. He was drawn to her and wanted to be with her, but he also feared that she might figure out who he was. So he went back and forth for a while between being very nice to Cassie (and seeming interested in her) and basically ignoring her. Luckily it didn't last too long in this book or it would have bugged me more. Time travel. I loved the concept of this book. The idea that Trent traveled back to the past and saved Cassie, but then met her again in the present was unique and interesting. I loved learning about Trent's time traveling - how it worked and how it affected him. It was especially interesting to see how it affected his sister Lorelai, since she was always left worrying about him when he disappeared! Trent and Cassie. The romance between Trent and Cassie was sweet. Trent felt protective of Cassie because he felt like he had somehow failed her by allowing her to get shot. So, he was drawn to her, but at the same time he felt like he needed to keep his distance in order to keep his secret safe. Cassie is also drawn to Trent - she has a flicker of a memory of him, but can't place where it comes from. Cassie struggles with self-confidence issues that stem from being shot when she was young, and she therefore doesn't always stand up for herself the way she should (especially when it comes to her jerk of a boyfriend, Jeff). But that gave her some room to grow throughout the series (which she definitely does). I loved seeing the romance bloom between Trent and Cassie and really felt for Trent when he made a rash decision and things went way wrong between them. The ending. I suspected that I knew where this book was going, but the ending headed in a different direction and surprised me, which I loved. This gave us a really great segue into the next book! 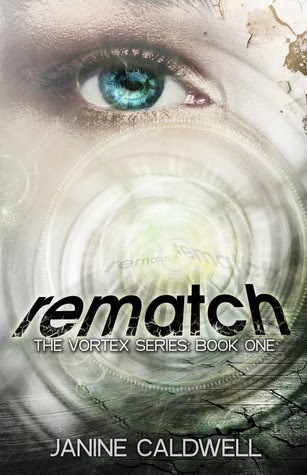 Rematch is a great romance for YA readers! I give it 4/5 stars. 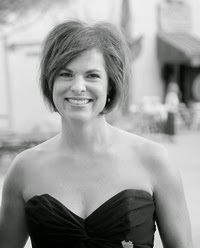 Janine lives in Anthem, AZ with her husband and two sons. When she’s not trying to stay cool, she’s playing tennis, practicing yoga, banging on the drums, or reading. As a lifelong literature fanatic, she knew it was only a matter of time before she would become obsessed with writing her own work. With relatives like the Brothers Grimm and Anita Loos (Gentlemen Prefer Blondes), she hopes fantasy writing is in her DNA. Books published by Janine include Visited, a YA coming-of-age fantasy, and The Vortex Series–Rematch, Double Fault, and Deuce.